Egypt go into this year’s World Cup with a somewhat peculiar squad. They have the best Premier League player of the 2017/18 season, Mohammed Salah. They also have Essam El-Hadary, the 45 year old who is bound to set the record as the oldest player to feature in a World Cup. Other notable mentions are Mohammed Elneny of Arsenal and Ahmed Hegazi of West Brom. The rest of the squad contains relatively unknown players on the international stage. 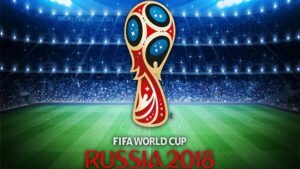 In what is their first World Cup in 28 years, they are bound to catch the attention of their fans as well as the world, thanks to the Mo Salah. The Pharaohs as they are affectionately called have dominated the African football seen completely in recent years. They are the most successful team in African Cup of Nations winning the tournament an unmatched 7 times. Their World Cup record isn’t the best even though They were the first African country to play at the World Cup. They qualified for the event only twice before this year( 1934 and 1990). Both campaigns ended in huge disappointment and they were eliminated from the group stage on both occasions. They amassed 13 points in qualifying finished ahead of Ghana, Congo and Uganda. Hector Cùper is the head coach of Egypt and employs a deep 4-2-3-1 or a 4-3-3 formation. Expect Egypt to sit back with all their players entrusted with defensive responsibilty except for Mo Salah in the World Cup. They have got a relatively easy group, so Cuper might have to shelve his ultra defensive mindset and be more adventurous especially to get the best out of Salah. Opposition teams might double mark Salah, so Egypt cannot have only one outlet of attack. Cuper must ensure that other attacking players are not too deep when Egypt gets a chance to counter. They generally play with a big traditional number 9, but Cuper has experimented recently with playing a front 2 by pushing Salah forward alongside a striker. The have a formidable goal-keeper in the form of veteran Essam El-Hadary. His reflexes and agility are phenomenal for his age. He capable marshals and controls the defence ahead of him. Beating him is no mean feat. Hegazi, who played well this season despite West Brown’s relegation, Gabr, Abdel-Shafy and Ahmed Fathy are expected to form the defensive unit. Hector Cùper used this same defence during qualifying and friendly matches and they have good chemistry between them. Egypt’s midfielders have to work overtime due to the freedom given to the wingers. The graft they put in contributes to the overall balance of the team. Hamed, Elneny and Said function as the midfielders in a three-man midfield and there is the tendency for any one of them to push up into the space behind the central striker. They are crucial to Egypt’s prospects this summer. The focal point of the attack and the player with the nation’s hopes on his shoulders is Salah. Salah played his most exceptional season of football yet and even though there are other good players in attack, he stands out as the star man. His over 40-goal tally should make opposition defenders carry of him and give the chance for his attacking partners to have some freedom. 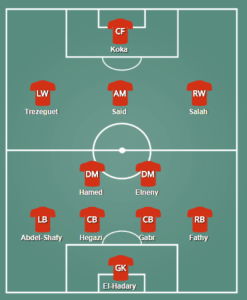 Hassan and Trezeguet are likely to join Salah in attack. If Salah can replicate his Liverpool form in Russia, then the Pharaohs have a chance of making a lot of progress.